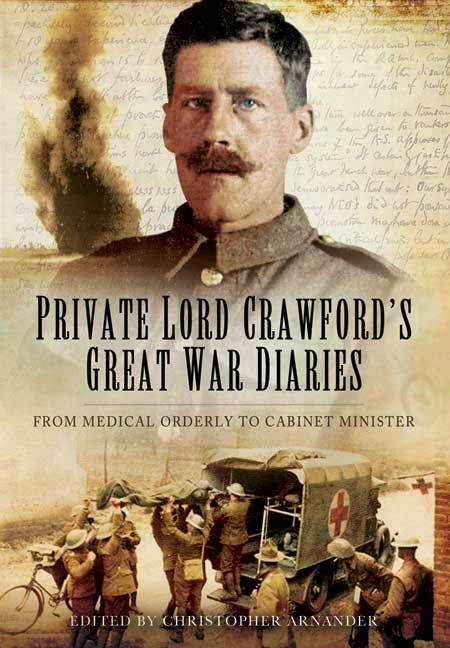 You'll be £19.99 closer to your next £10.00 credit when you purchase Private Lord Crawford's Great War Diaries. What's this? Order within the next 2 hours, 28 minutes to get your order processed the next working day! This unusual account is written by the 27th Earl of Crawford and Balcarres, an active Lancashire MP for 18 years until he inherited the title on his father's death in 1913. In 1915 his sense of patriotic duty drove him to join the RAMC as a Private, although he was married with 7 children, head of a large company and well over age. Despite his privileged status in civilian life, he cheerfully served as a humble medical orderly on the Western Front for some 14 months and was given responsibility for two operating theatres. A gifted author and diarist, his daily entries provide a fascinating insight into life near the front over this period and, together with his letters home, his writings reflect the stark contrast between his home life and the one he experienced in Flanders. Of particular interest are his astute observations on his contemporaries of all ranks, the conduct of the war, medical services and life in wartime France. Remarkably he never complains at his lot (although often sharply critical of GHQ and politicians) or regrets his decision. As the Author was the only Cabinet-level politician to serve 'in the ranks' during the conflict, this is a record without any parallel. In 1916 Crawford was persuaded eventually to return to London and join Asquith's Cabinet before staying on under Lloyd George until 1922. After the war, he became a director, trustee or advisor of several museums, such as the British Museum, National Gallery and others. The Crawford Papers (his diaries, edited by Prof John Vincent) describe his civilian experiences from 1892 to 1940 and are seen as an invaluable source for students of politics, art, industry and society in Britain. The book contains three maps and 75 illustrations. This fascinating book fills a needy gap at a time of unprecedented interest in The Great War. Pays tribute to the Art Fund's founding chairman, who joined up a century ago, aged 43, to serve as a medical orderly in Flanders. This new volume, excellently edited and admirably timed for the centenary of the outbreak of war, brings us a second instalment of the diaries covering the remarkable period of [Crawford's] life spent in the ranks which was largely omitted from the earlier edition. Lindsay's acute observations, lack of jingoistic sentiment, and trenchant style make this unusual and provocative book a very compelling read, but its editor has made it all the more compelling by providing a wealth of informative footnotes and a very rich selection of unusual illustrations. A unique document of the greatest interest to anyone studying the Great War. The diaries have been extremely well edited by his grandson whose footnotes and explanatory comments about the state of the war at that point are one of the great delights of the book. You can read it straight through from the beginning... or dip into it at any point and be immediately caught by the dry observations on people he met, odd things he saw, Germans who spoke excellent English, English officers who spoke not a word of French or German. A remarkable and highly readable first-hand record of the life of a medical orderly in French Flanders. Gives a unique close-up view of the Great War through the eyes of a shrewd participant. The remarkable tale of how David Lindsay, 27th Earl of Crawford and Balcarres, chose to become a private in the Royal Army Medical Corps, serving on the Western Front during the First World War. His story is well written and told without complaint, despite his accounts of misdirection from higher up the ranks. Lord Crawford was the only Cabinet-level politician to serve 'in the ranks' during World War I as a private. A gifted author and diarist, his daily entries provide a fascinating insight into life in the frontline over a fourteen month period. LORD David Lindsay rejected the high life of a nobleman in 1915 to volunteer as a private, dealing with destruction and death on a daily basis. His diaries have now been turned into a fascinating new book. BBC Radio 4 Today (27/12/2013) - Interview with former MI5 chief Baroness Eliza Manningham-Buller, granddaughter of Private Lord Crawford. Christopher Arnander pursued, after Oxford University, a banking career before becoming a Middle Eastern consultant. He has written a number of books including two bi-lingual proverb books Pavilions in the Air and You Can’t Get Blood Out of a Turnip.